The Daihatsu Mira (also known as the Cuore, Domino, and more recently Charade), is a kei car-type vehicle built by the Japanese car maker Daihatsu. It comes with a variety of options and chassis variations, with the latest variant having four models: "Mira", "Mira AVY", "Mira Gino" and "Mira VAN". The Mira is the latest successor to the line of cars begun with the Daihatsu Fellow of 1966 and was originally introduced as the commercial version of the Cuore. Outside Japan, the Mira has also been offered with an 850 cc or 1000cc engine. In Australia, the two-seater version was marketed as the Daihatsu Handivan and later as the Daihatsu Handi. The name "mira" is Latin meaning "goal" or "purpose." The second generation (L70) Mira/Cuore appeared in August 1985. It had a longer wheelbase and a new generation of three-cylinder engines replacing the previous two-cylinder (AB) versions. Displacement of the new EB engines remained exactly the same, at 547 cc. For the L80 export versions a 847 cc three-cylinder was developed, called ED-10. Along with this, a walk through van version was produced by adding a tall, square body to the existing chassis. In September 1986 a special version for the Swiss market appeared, with a narrower bore version displacing 796 cc (called ED-10A). Unlike the fractionally larger standard version, this one suited the four tax horsepower category in certain cantons, while other cantons had prominent tax limits at 800 cc. This generation shared a GM platform. This is one of the 'Owners Club' series of easy to build 1/32 cars that have been produced by Arii. In this case, it is a fairly large one thanks to the tall van body. Molded in yellow (undoubtedly to assist with painting), the kit is a tad more complex than some of the previous offerings thanks to the large, quite visible cargo area. 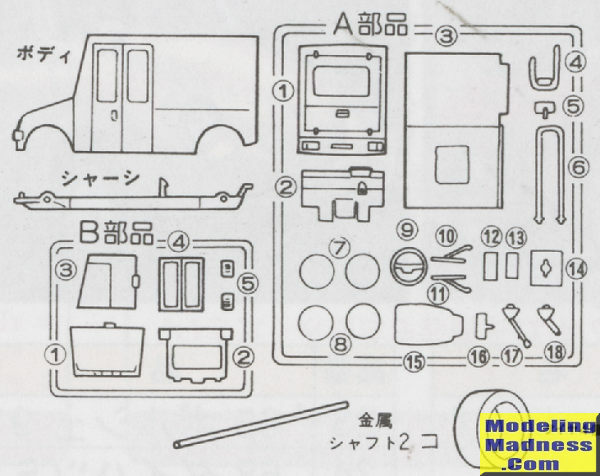 In order to get all the bits in a standard box, the van body has a separate rear end that allows the sprues to be partially slotted into the body shell. This kit has two metal axles that slide through holes in the floor pan. The interior consists of a single driver's seat with a safety bar behind him to keep cargo from sliding forward. Parking brake and gear shift are supplied as is a steering wheel that slides into the dash section. This all fits atop an interior tub that then glues to the chassis pan via large attachment areas. All of the clear sections are quite large as well and have positive locators on the roof. If one wishes, the side and rear doors can be cut to be displayed open. This will also require the clear pieces to be cut to accommodate this and were I building this option, I'd look for some clear, thin, acetate sheet to replace the plastic clear bits. Wipers, side mirrors, plates and lights complete the build. Instructions are a folded sheet in Japanese, but things are pretty easy to figure out. Gunze paint numbers are provided for many of the parts. The decal sheet is nicely done and duplicates the box image. With all that side area, there is room for some sort of custom design or paint. These are great little kits. I've built several from the series and think you'll enjoy the fairly easy build they provide. Not only that, but they look nice when done. These would be appropriate for newer modelers who have graduated from snap kits and can handle the small pieces. Thanks to me for ordering this one in.